Road Runner Girl: Bondi Band Review and Giveaway!!! 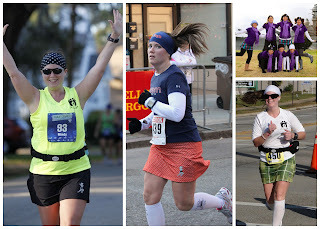 It's no secret that I like to look cute when I'm running! 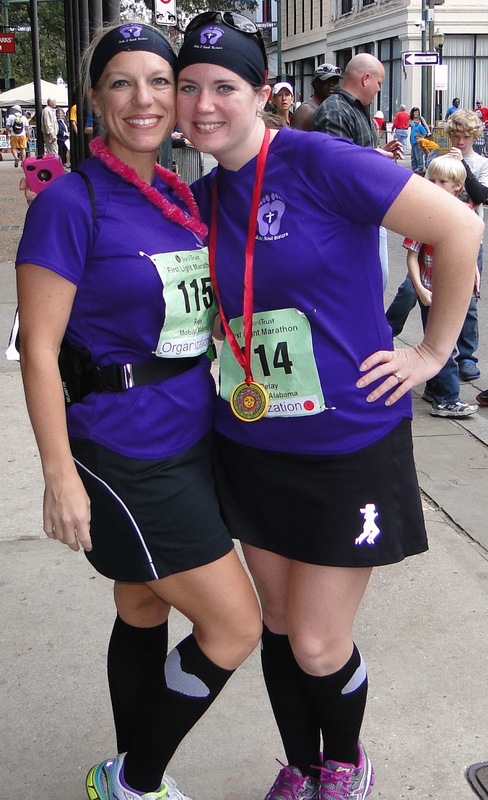 That's why I run in a skirt and always have something cute in my hair! 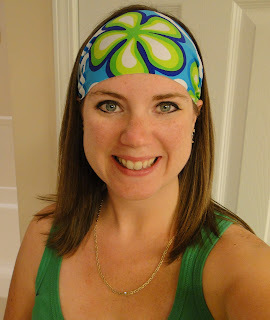 One of my most favorite products is Bondi Bands! They look cute when you're just hanging out! Or when you are running! But the BEST thing about Bondi Bands (in my opinion) is their wicking capability. I live in the south and it gets really hot here in the summer. I need something that will keep the sweat out of my eyes. Bondi Bands do this perfectly! When everyone else is wiping sweat out of their eyes (and you know how bad that burns) I am perfectly happy because my Bondi Band has collected all the sweat and kept it from running down my forehead into my eyes. That's why they say their Bondi Bands are "No Slip, No Drip." It's really true...they collect all the sweat and they don't slip on your head! Plus...they are super cute and fun!!! Their products are unisex. My hubby actually borrows mine when he does P90X workouts! They are 100% American made. I love this because so many things are not made in America anymore. They can be worn on their own or under other hats, helmets, and visors. They are made of stretchy, breathable material which allows them to fit virtually every head size and shape. Their fashion lycra fabric is fun and perfect for every day. I've also worn these while running..they still wick the sweat away! In warm weather the "No Slip, No Drip" moisture wicking headbands are great to wick away sweat, keep hair back, and keep ear buds in ears. In colder weather, they are great to keep your ears warm. I always wear my Bondi Bands covering my ears in the winter! Bondi Band donates 10% of pretax profits to Dana-Farber Cancer Institute. How awesome is that??? In addition to the headbands they offer armbands, wristbands, wicking hats, wicking ponytail hats, wicking pigtail hats, wicking neck gators, wicking sweat towels, and even items for your children and dogs!!! They offer customized products. With every Sole2Soul Sisters group that we train...we order Bondi Bands customized with our copyrighted logo! So who wants some Bondi Bands? Kelly at BondiBand was kind enough to send me TWO of these awesome headbands to give to YOU! One of them is made of the lycra material and the other is made of the wicking material. They are both SUPER cute! Mandatory: Visit Bondi Band's website and tell me which headband is your favorite and why. Extra entry: Follow my blog via Google Friend Connect and leave a comment saying you did this. That's it! Winners will be picked using random.org. The giveaway will end on Tuesday August 14th at midnight CST. Good luck!!! Disclaimer: Bondi Band sent me their product to giveaway. I received no other compensation. All opinions in the above post are mine and mine alone! Sorry! This giveaway has ended!